Joseph Joseph Elevate™ Stainless Steel Tongs with silicone tips can be locked and unlocked easily for maximum space saving in your drawer. 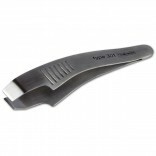 Elevate™ tongs are made from durable stainless steel with silicone tips which are heat resistant up to 270°C/520°F. Ideal for turning a whole host of foods in the pan, or transferring to your plate, these 12-inch stainless steel kitchen tongs can be locked together to take up less space in your utensil drawer. These handy tongs also feature Elevate™ technology which is designed with a tool rest which means when you place it down, the head of the tool does not touch the work surface, reducing mess and improving hygiene. Concept by Gillian Westley | Designed by Derek Roberts. Dimensions H 31.5 x W 5.7 x D 3.5 cm (H 12½ x W 2¼ x D 1 inches).